A variety of diseases affect poultry of all kinds, ages and sexes. But certain ailments primarily strike laying hens. These diseases cause reproductive issues and can kill your bird. Practicing good preventive measures can reduce the chances of your hens becoming ill. 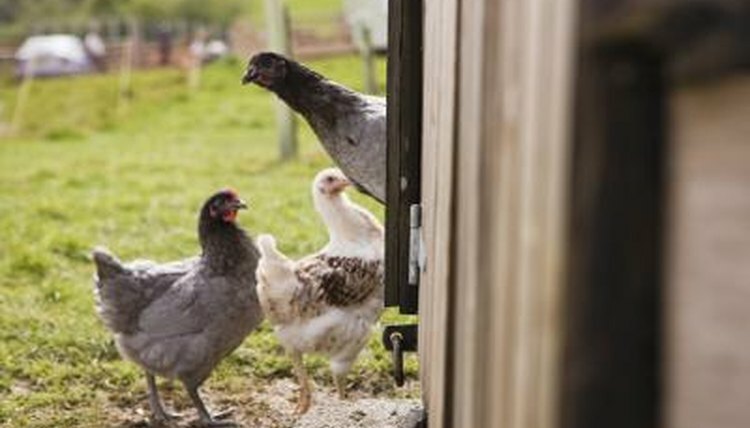 These include quarantining new hens for at least three weeks before introducing them to your flock. The only signs of egg drop syndrome appear in the eggs. Laying hens who outwardly appear healthy will begin producing eggs that either lack shells or have too-thin ones. Some hens might experience diarrhea shortly before thin-shelled eggs start appearing. According to the University of Florida extension website, researchers believe egg drop syndrome originally resulted from chickens inoculated with contaminated vaccine. Egg drop syndrome can pass from asymptomatic hens to their otherwise healthy chicks, the chicks spreading the virus in their stool. While no treatment exists for egg drop syndrome, a hen will usually resume quality egg production after she has gone through a molt. Feeding your flock a quality feed designed specifically for laying hens is crucial not just for egg production but for bird health. Diseases can result from nutritional imbalances in homemade or "cheap" feed -- especially regarding the correct calcium phosphorus ratio. If you find a hen alert but unable to move, she might be suffering from caged layer fatigue. If not treated, she can die from dehydration. Treatment consists of moving the affected bird to her own cage with easy access to water and quality feed. If the entire flock is eating the same lower-quality feed, replace it with appropriate feed to avoid further instances of the disease in your hens. Allowing hens to move freely rather than remained caged also helps prevent the disease. Hens can develop rickets if lacking sufficient vitamin D or if the correct calcium-to-phosphorous ratio of 2-to-1 is out of whack in their feed. Symptoms include thin-shelled eggs, fractured limbs, low egg production, lameness, and soft and bowed bones. While rickets rarely occurs in flocks fed a commercial laying hen ration, it can show up in birds fed homemade feed. If your hens are fed quality commercial feed and develop rickets, the disease can result from an intestinal viral infection that harms the bird's ability to absorb nutrients. The initial sign of fatty liver syndrome might be dead hens. It occurs when too much fat accumulates in the hens' livers, eventually causing hemorrhaging and death. Hens with fatty liver syndrome often have pale combs. Prompt feeding changes might prevent the liver from rupturing. This would entail reducing the amount of carbohydrates fed to your birds. Egg peritonitis occurs when the abdominal lining, or peritoneum, becomes infected and inflamed. This usually occurs because a yolk didn't head out the hen's oviduct, as it should, but went into the abdominal cavity. Symptoms include a swollen abdomen or odd stance. Your vet can give your hen antibiotics to fight the infection and drain the abdomen, but most hens afflicted with egg peritonitis aren't going to survive.